I have another great keto side or snack to share today. As you know, I am on a goat cheese kick right now and was trying to think of ways to incorporate it with other foods I can eat. I sometimes struggle to find a creative snack or side to go with my meals as the same old cauliflower, broccoli, and brussels get old. While at the grocery store the other day it hit me... 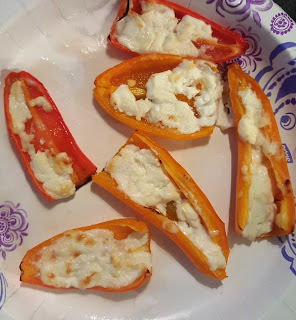 Goat Cheese Stuffed Sweet Peppers. So tonight, I made that thought a reality. It is super easy to make and turned out awesome. Cut sweet peppers in half, rinse and remove seeds. My grocery store sells sweet peppers in bags.Stuff goat cheese inside each half of pepper, as much as you like. Place on baking sheet. Bake in oven on 425 for about 12 minutes or until peppers and cheese start to brown. Once removed from the oven, sprinkle lightly garlic salt over the top. Enjoy.